The city of Jakarta announced its journey towards becoming a smart city last year. Since then, the Jakarta Smart City Division has produced various platforms for citizens to engage with data like never before. Jakarta’s Governor Basuki ‘Ahok’ Tjahaja Purnama is tasked with guiding them towards smart city development. Recently, the city of Jakarta went through tender offers to construct the Light Rail Transit (LRT). Ahok said this project will connect seven corridors: Kelapa Gading – Kebayoran Lama; Pantai Indah Kapuk – Soekarno-Hatta International Airport, Kemayoran – Kebon Sirih, and Kebayoran Baru – Kebayoran Lama – Tanah Abang. 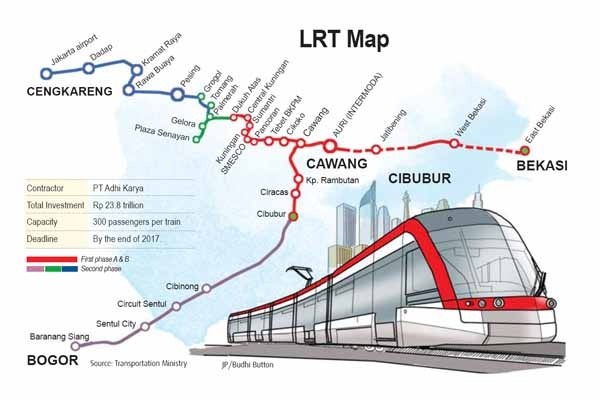 The LRT project is estimated to cost Rp 35 trillion. Its efforts will be divided in two phases, with the second launching in 2016. The first phase will include 18 stations and about 42 kilometers long. The second phase will extend this by 41.5 kilometers. Early September, President Jokowi kicked off the launch of the LRT construction. The pressure is on for Jakarta to open the LRT by the 2018 Asian Games. In 2020, the LRT lines are expected to be fully operational. Only then, the residents would be more inclined to use the transportation system to the fullest.